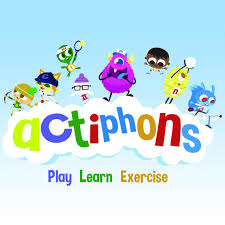 Actiphons is a unique phonics teaching resource and programme which inspires children to learn their phonics through playing fun, sporting activities. Learning phonics through this kinaesthetic approach has lead to significant and positive improvements in childrens literacy skills whilst allowing children to experience more sports and fun, physical activities creating healthy, active lifestyles. Actiphons is an innovative phonics teaching resource and programme for Early Years and Key Stage 1 children which complements, enhances and supplements existing teaching methods of phonics making it 100% compatible with the governments Letters and Sounds programme, but links physical activity and a kinaesthetic approach as a means of reinforcement and learning.